Vinegar has been hanging around our kitchens ever since there were kitchens, but did you know that you can also use vinegar for cleaning the kitchen? We are all familiar with using vinegar in pickles, salad dressings, and other recipes in the kitchen, but vinegar also makes a great cleaner, deodorizer and germ killer. In this article I am going to talk about the uses of vinegar for cleaning the kitchen, but be sure to check the links at the bottom of the page or in the left column to find out how to use vinegar as a deodorizer and germ killer too. Just keep in mind that while you are cleaning your kitchen with vinegar, you are also deodorizing and killing germs. Not only that, but you are using a product that is safe for your family instead of using products that contain harsh chemicals. And the money you will save using vinegar for cleaning the kitchen, over the cost of those commercial products will make your whole family smile. Mix 1/4 cup of vinegar and a squirt of Dawn diswashing detergent in a 32 ounce spray bottle. Finish filling the bottle with clean tap water. You can add a few drops of your favorite essential oil or even some lemon juice for frangrance if you wish. Clearly label the spray bottle with the contents. Shake well before each use and then just spray on countertops or appliances and wipe with a damp sponge or cloth. This vinegar cleaner is probably not tough enough for those really greasy jobs, but if you use it daily it will help prevent that grease buildup. It is great as an everyday cleaner and for cleaning up spills. To clean your refrigerator, you can use the recipe on the right or if you prefer, you can just mix 1 part vinegar to 3 parts water in a spray bottle. The recipe on the right requires rinsing since it contains dishwashing detergent, but if you don't have a lot of sticky messes in your refrigerator, the vinegar/water solution works great and you don't even have to rinse. If you use warm water in your mixture it seems to work better in a cold refrigerator. You can also prevent mildew from building up on the rubber seals of your refrigerator door by wiping them with undiluted white vinegar every once in a while. You can also do this inside the refrigerator to keep mildew from forming there. To reach inside the folds of the rubber seal, try using a toothbrush. And remember, there is no need to rinse! In fact it works better if you don't. 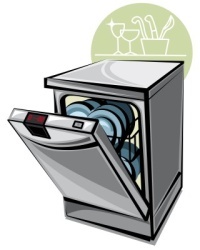 If you live in an area with hard water, like I do, you will notice a buildup of mineral deposits in your dishwasher. You will probably notice that soap scum tends to build up over time too. You can place a cup of vinegar in an otherwise empty dishwasher, and run it through one complete cycle about once a month. Not only will you notice less soap scum and mineral deposits in your dishwasher, but the vinegar is hard at work on parts of the dishwasher that you can't see too, keeping it working more efficiently. Mix 1/4 of vinegar and a cup of water in a microwave safe bowl and place in the microwave. 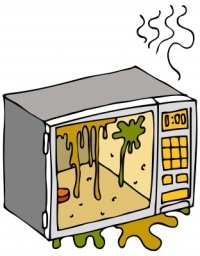 Turn the microwave on high power and boil the solution for a few minutes. Carefully remove the bowl as it will be hot! You will find that the splattered-on food has been softened and loosened and you can wipe it all away. Your microwave will smell clean and fresh too! If you have stains or streaks on your stainless steel kitchen utensils, flatware or bowls, you can clean them by first rubbing them with Olive Oil. Then, dampen a cloth with vinegar and use it to buff the item. It will shine like new. For stainless steel appliances, like stoves, refrigerators and dishwashers, you can spray the surface with white vinegar and then dry with a soft cloth. This works great for removing fingerprints and smudges, and keeping your stainless steel appliances looking like new. If you have a cloudy film on glassware that you want to get rid of, just soak them overnight in a mixture of half vinegar and half water. Then wash them by hand the next day. To keep crystal looking like new, just wash by hand as usual, then dip the crystal in warm water with a tablespoon of vinegar added, then rinse with clear water. If you have a stubborn stain that you can't get rid of, try making a paste of vinegar and baking soda and gently clean the stain with a soft cloth. When cleaning silver pieces, fill a large bowl or tub with vinegar. The size of the container depends on the size of the silver item being cleaned. Add baking powder until you see the mixture start to bubble. Dip your silver pieces into this solution for a few seconds and then buff with a clean, soft cloth. For stubborn tarnish, you may need to repeat the process and leave the silver pieces in for a bit longer. For Sterling Silver pieces, make a paste of 2 tablespoons salt and 1/2 cup of vinegar. Use a soft, clean cloth to gently apply the paste in a circular motion. Rinse thoroughly and dry with a clean, soft cloth. If you have copper-bottom pans like I do, you know how fast that copper can tarnish. To keep your copper-bottom cookware looking like new, spray with undiluted white vinegar. When you notice that the vinegar is beginning to remove the tarnish, sprinkle on a little salt and scrub with a sponge. Rinse well. If you have a burned-on mess on your broiler pan, try pouring 2 cups of vinegar into the pan while it is still hot. Add 1/2 cup of sugar and let it soak until your meal is over and you have cleaned up the kitchen, probably about an hour, then wash as usual. And for a really greasy frying pan, try heating 1/4 inch of water in the pan, add 1/2 cup of vinegar and let it simmer for a few minutes. Wash and rinse as usual. Remove stains and odors from your pots and pans by filling the pot with a vinegar and water solution and boiling until the stain has been loosened. Wash as usual. You can use vinegar for cleaning your coffee maker too! Pour a cup of vinegar into the water resevoir of your coffee maker and finish filling with clean tap water. Run the coffee maker through a cycle just as if your were brewing a pot of coffee, except do not add coffee grounds. After the coffee maker has cooled off, run it through a cycle again with cool, fresh water to rinse. Clean your coffee maker monthly to keep it working efficiently. You can clean your drainboard by soaking overnight in a sink full of water into which you have added about a cup of vinegar. 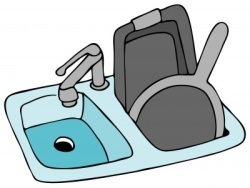 If your drainboard is too large to fit in your sink, you can pour vinegar onto the drainboard and let it sit overnight. Wash away the stains the next morning. Clean and disinfect cutting boards by wiping down with full strength white vinegar. A thermos can be cleaned by adding 1/4 of vinegar, some rice and water and shaking vigorously. The rice helps scrub the sides of the thermos. Rinse well. 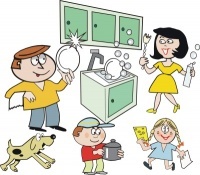 When handwashing dishes, add a little vinegar to your normal soapy water to cut grease and kill odors. You can remove mineral deposits from kitchen faucets by wrapping them in cloths or paper towels that are soaked in undiluted white vinegar and letting it set for a couple of hours. If you wrap the area in plastic wrap it works even better as it keeps the area moist longer. Then use a cloth or soft brush to clean away the loosened mineral deposits, rinse and dry. When you use Vinegar for Cleaning the Kitchen, you will have a sparkling clean and shiny, deodorized and disinfected kitchen that you can be proud of. And you can rest easy knowing that your family hasn't been subjected to any harsh chemicals or toxins. You can also use vinegar for cleaning the bathroom. Click the link below to find out more.